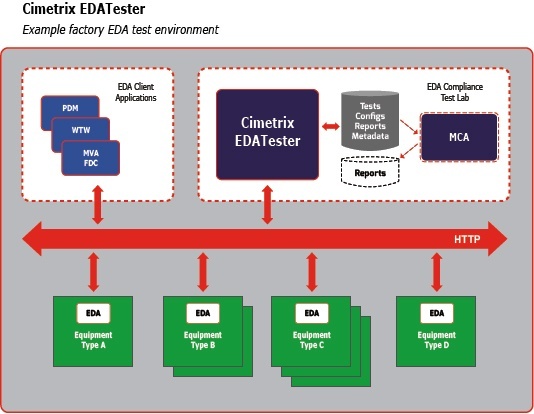 The Cimetrix EDATesterTM is the integrated solution that supports the broadest range of use cases in SEMI Equipment Data Acquisition (EDA/Interface A) standards compliance testing in the industry. The benefits of using the EDATester to automate the testing/reporting process include saving valuable engineering effort and tool time, improving coverage of testing requirements, providing consistent results through a repeatable process, and achieving the “first time right” goal for interface acceptance testing in the factory. The Cimetrix EDATester maintains a library of test configurations for the many equipment connections needed to perform your testing tasks. As such, it is suitable for use for a small number of equipment types in an OEM setting, or for testing the full range of equipment that will be delivered with EDA interfaces in the factory. An example system configuration for the latter is shown below. There are three components of the EDA interface testing process—EDA Standards compliance testing, performance testing, and metadata model conformance testing. Note that the EDATester only supports Freeze II (0710) implementations of the SEMI Standards.